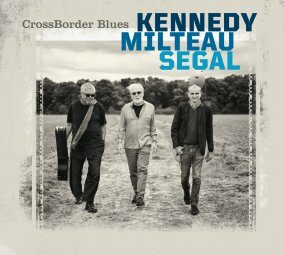 CrossBorder Blues…, or when three exceptional creative talents throw themselves into a series of jubilant explorations built on acoustic blues echoes and the unusual blend of sounds sparked by their meeting. Harrison Kennedy’s voice, banjo, spoons and guitar, Jean-Jacques Milteau’s imaginative harmonica and Vincent Segal’s lyrical cello converse and play as the members of this inspired trio pay homage to their roots without sacrificing to nostalgia, inventing no less than the future of the blue note in the process. A careful scrutiny of his unusual musical journey might lead you to think that Harrison Kennedy wishes to cover his tracks. Starting with the Canadian passport this pure African-American owes to forebears who traveled the Underground Railroad all the way to Ontario, fleeing the Southern plantations where they were enslaved. Harrison has kept from this aching heritage a deep respect for the Mississippi and Tennessee roots he nurtures to this day in a truly original and personal fashion. Universally regarded as one of the most genuine artists on the blues front today, the proud holder of a 2016 Juno Award (the Canadian equivalent of a Grammy) and recipient of the 2015 Blues Prize granted by Académie Charles Cros got his start at the height of the soul era. After making a noted debut on the prestigious Motown imprint (Harrison can be heard blowing his harmonica on Marvin Gaye’s legendary What’s Going On), he joined the stellar group Chairmen of the Board, traveling across the world and sharing the stage with the likes of Stevie Wonder, George Harrison, and Tom Jones, among others. As for Vincent Segal, winner of an impressive number of Victoires de la Musique and with twenty years on the road with Cyril Atef and the duo Bumcello under his belt, his cello has graced an impressive number of projects in a wide variety of musical styles: jazz (Ibrahim Maalouf, Julien Lourau), funk (Chuck Brown), rap (Oxmo Puccino), rock (Sting, Elvis Costello, Bashung), pop (M, Carla Bruni, Thomas Fersen), as well as African “chamber music” through his inspired duets with Ballaké Sissoko.